Andrew Weiner wants us to move faster. Not at the supermarket checkout or the drive-up at Starbucks; he wants to move our data faster, at rates of speed previously only dreamed of. By working to expand ultrafast optical signal technology, Weiner, Scifres Distinguished Professor of Electrical and Computer Engineering, is broadening the field of optics and creating new avenues for applications as varied as the music we download to the wireless radar used by military interests. Hailing from Winter Park, Florida, Weiner received his doctorate in electrical engineering and computer science from MIT in 1984. 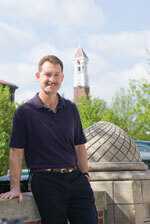 Prior to joining the faculty at Purdue in 1992, Weiner spent nearly a decade with Bellcore, one of the premier research organizations in the telecommunications industry at the time. He is widely recognized as a pioneer in the field of femtosecond pulse shaping. Weiner’s current research in ultrafast optics and optical fiber communications focuses on the technology and application of ultrafast laser pulses. By developing and applying technologies for manipulating and processing femtosecond lightwave signals, his work is playing a significant role in revolutionizing how our information moves and, more significantly, how to move it at greater speeds. Likening the movement of information to a highway of fiber optical data and pulses, Weiner sees the infrastructure of that highway as something of benefit to everyone. With applications both civilian (yes, that iPod in your ears) and military (such as distribution of high bandwidth radar signals), the revolution in ultrafast fiber optics will speed the way information moves and how it gets to us. Recognition for Weiner’s work has been voluminous and this year has been particularly rewarding. He was recently awarded the R.W. Wood Prize of the Optical Society of America, which recognizes outstanding discovery, scientific or technological achievement, or invention in the field of optics. He received the 2008 Purdue Graduate School Outstanding Graduate Mentor Award, which recognizes excellence in mentoring graduate students. In February, he was elected to the National Academy of Engineering, among the highest distinctions given to an engineer, which recognizes pioneering contributions. While it’s gratifying to be awarded for his accomplishments, one of the most satisfying things Weiner finds about his job is the opportunity to work with graduate students, to him “an investment in human capital,” who he helps prepare for careers in industry and academia. With a belief in early guidance for students in the laboratory, Weiner enjoys seeing them grow and become intellectually self-sufficient. By creating an atmosphere that challenges students at all levels, novice students benefit not only from their interactions with him, but from work with more senior students. For Weiner, there is no better place to be doing the kind of work he loves than at a university, and for him there is no higher caliber institution than Purdue in terms of laboratories, students, and fellow faculty. The freedom to decide the direction of his research is complemented by the challenge of attracting prospective students and getting them excited about that research. Weiner is grateful for the opportunity to work and mentor what he sees as an “incredibly talented pool of people” in constant stream through Purdue’s program. With the potential for growth along the information superhighway still in its relative infancy, Weiner is helping to ensure Purdue continues to set the pace of that growth.